The 10-year Treasury note averaged 2.72% in January 2019. This is up from a cyclical low of around 1.5% in mid-2012. Interest rates rise and fall in a cycle, and the current rising trend will include two-to-three decades of rising interest rates. This will dampen home price increases, as buyer purchasing power is continually reduced. Lenders use the 10-year T-Note to determine a homebuyer’s mortgage rate. The difference between the note rate and the 10-year T-Note rate represents the lender’s risk premium, which covers potential losses due to mortgage default on a 20% down payment, private mortgage insurance (PMI) covering the added risk of a lesser down payment. While the 10-year rate recently peaked in 2018 around 3.2%, increased global investment in U.S. Treasuries has seen the 10-year rate fall back to the present 2.72% average in January 2019. In 2019, bond market investors are feeling discouraged in light of the slowing economy and instability emanating from the federal government. This has led them to accept lower yields in return for the safety of treasuries, which in turn has kept FRM rates down at the beginning of the year. FRM rates will not rise significantly over the next few years. Updated February 4, 2019. Original copy released June 2012. 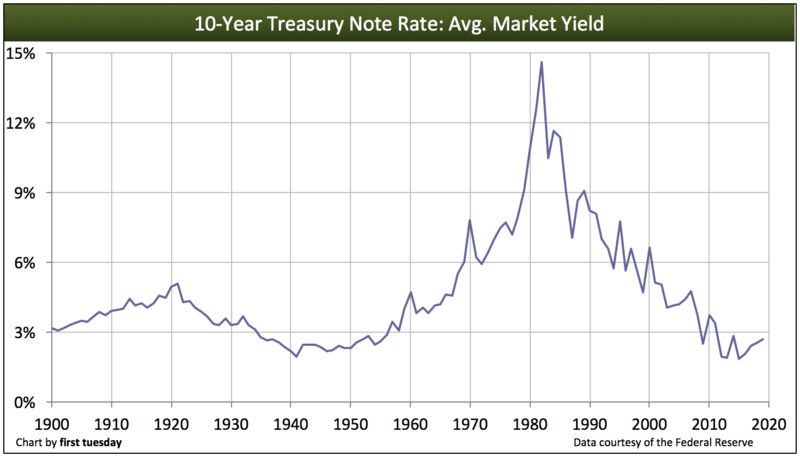 The average monthly 10-Year Treasury Note (T-Note) yield since 1900 is shown on the chart above. As demonstrated, interest rates on the 10-Year T-Note have shown an overall decline since 1980, following a rise from lows last reached in 1941. We can now see that 1940-1950 marked the beginning of what has become a 60-year rates cycle: approximately 30 years of rising rates, followed by 30 years of falling rates. This roughly mirrors the 60-year period prior to 1950, in which interest rates peaked in 1921. As we make our way through the current 60-year rate cycle, first tuesday expects another slow upward run in rates for 20-30 years from the bottom (2012), and then a reversal into rate declines as occurred following 1980. The interest rate on the 10-Year T-Note dropped as low as 1.47% in early June 2012 as the euro, the renminbi, and the Brazilian real all weakened against the U.S. dollar. These lows were extreme and are evidence of international monetary stress. Mortgage rates have historically moved in tandem with the 10-year T-note at a 1.5% spread. However, this 1.5% spread was elevated – at around 1.5-1.7% – for several years following 2012. This spread rose to 1.7%-1.8% in the second half of 2018 as lenders, cautious about the future economic outlook, padded their risk premiums. 10-year T-notes will continue their long rise as we head into 2019. The upcoming period of rising rates is likely to last for quite a long time – two or three decades. The last three cycles in bond market rates have been extremely regular, according to Chris Watling of Longview Economics. A 27-year downtrend in rates (1922-1949), followed by a 32-year uptrend (1949-1982) and another 31-year downtrend lasting to the present. While the regularity of this pattern of 30-year passages should be considered coincidental (they very easily might have been forty years, or twenty), precedent establishes that bond market rate changes are much slower and more gradual than, say, changes in the stock market. In previous interest rate cycles, rates rose for approximately thirty years, peaking in 1921 and again in 1979 after rising from essentially zero in the late 1940s, following the recovery from the Great Depression. In 1947, at the end of World War II, interest rates on the 10-year T-Note were near zero, much as they are today. 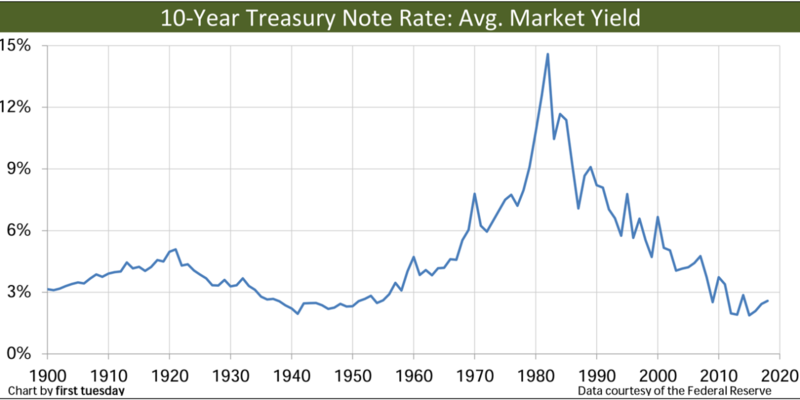 Then, from 1947 to 1979, rates moved steadily upward. 1947 is a key year for other reasons as well: it marked the end of a recession, and a long-awaited return to prosperity after the Great Depression of the late-1930s. If this interest rate pattern holds true, as first tuesday expects, we now find ourselves at the beginning of a reversal in the real estate market comparable in type, if not in intensity, to the turnaround after 1947. During the resulting half cycle of rising interest rates from 1949 to 1982, the wealth of investors increased even as interest rates rose, housing construction was very strong and employment and prosperity increased as well. The American Dream of jobs, cars and homes for all was in full bloom during this period. We expect to experience similar conditions during the next two or three decades, into the mid-2030s (this time, hopefully without the stimulus of a war effort). For the housing market, however, rising interest rates, even static interest rates, mean that there will be no short-term profits to be had from any increase in pricing. The notorious “Greenspan Put,” which we have grown accustomed to seeing after every drop in interest rates, will not and cannot be repeated to artificially generate profits in any asset market – commodities, stocks, bonds or real estate. Mortgage rates are inextricably tied to bond market rates, and every increase in bond and mortgage rates means a decrease in a homebuyer’s purchasing power – the amount they can borrow based on repayment at 31% of income – and an increase in the earnings of the rentier class. Thus, a buyer will experience a decrease in the amount they can pay for a home. Less money borrowed by homebuyers means lower prices received by sellers for their properties. The Fed ceased its final round of quantitative easing (QE3) in October 2014, promising to keep the short-term interest rate low (around 0.25%) until the economy improved sufficiently. The Fed stated their intention to raise interest rates by the end of 2015, and finally increased the short-term rate by 0.25% in December 2015, and several times in 2016-2018. The current Fed chair has stated they may increase rates once more in 2019, or they may hold off. Then, once an economic recession is imminent, the Fed will take their foot off the pedal, letting rates fall back. While FRM rates will continue to rise over the long term, 2019 may see rates fall back slightly as we head into the next recession, anticipated to arrive in 2020. As rates have increased significantly in 2017-2018, agents have quickly learned to cope with an unfamiliar set of investment and pricing challenges (including different income multiplier/capitalization rates, long-term holding periods before profits can be taken, and Due-On Sale clause assumptions). The key lesson to remember in the upcoming years will be that real estate is most properly priced and held for its inherent rental value. Those who buy property for speculative gain, not rental income, will see as little success in gains from a flip as those who invested in the real estate market from 1950 to 1980, when mortgage rates moved slowly, steadily upward until they exceeded 18%. The next peak in rates, whether or not they reach past heights, will likely take another 20-30 years to arrive. But this last cycle’s days of steadily decreasing interest rates, accompanied by steadily falling rents, producing ever increasing prices and profits (and §1031 hysteria) have run their course to the bitter end. In the last two decades, it was possible to purchase a parcel of real estate, vacant or improved, and take a profit, much greater than the rate of consumer inflation, merely by holding that parcel for a short period of time. This is no longer an option. Prices may rise in narrowly defined locations enjoying a population density explosion, but most will be dampened by constantly rising interest rates which will keep prices from rising faster than the rate of core inflation. The negative pricing effects of increasing interest rates can be at least in part counterbalanced by improved zoning. If property prices rise beyond the rate of inflation, local governments will have to permit density to increase to accommodate those who are attracted to the area or suffer the consequences of an asset inflation bubble. Smart investors will look to purchase property in urban centers which have already begun to establish themselves as the most desirable abodes for the next generation of homeowners and tenants. In the long run, investors in real estate will need to increase their wealth, not by flipping their properties for profit, but by generating rental income over the course of long-term ownership. Income property will be bought to be operated and managed for an annual net operating income, capitalizing at the rate proper going forward. In boom times, property owners were accustomed to capitalization rates (cap rates) of 6% or less. For the upcoming years, 10% may be more normal. Prudent property selection, careful research, forward-looking capitalization rates and a long-term commitment to real estate ownership will be the keys to success in the new paradigm. NextPOLL: How will deregulation of mortgage lending affect homebuyer demand? 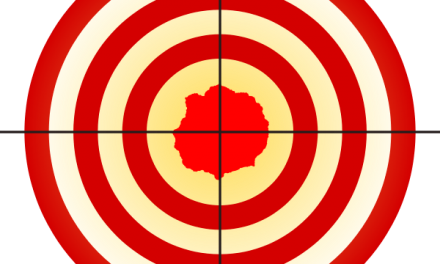 Is agent poaching just creating foot soldiers for the realty front lines? Steadily falling rents? Really! You need to proofread your articles. Thank you for pointing out this potentially confusing sentence. We have clarified, referring to this last cycle rather than the one we are currently in during 2019, in the copy above. 12-13 From the observation data above, it was seen that the longer synthesis time generated aurantiol with greater refractive index, density, and specific gravity. This was due to the increasing quantity of methyl anthranilate in the aurantiol product, in which methyl anthranilate had the biggest density. So it can be concluded that the duration of synthesis time was directly proportional to the refractive index, density and specific gravity of the aurantiol product. This article leaves out several issues. For example, the article does not take into consideration the fact that the world today, thanks to the internet is now based on a world economy and does not include the current economies of China, Russia, Japan and all of Europe. Plus, the article also leaves out discussing inflation and the national deficit. When the current administration is no longer in office the national deficit is predicted to be over $20, TRILLION and climbing. The current inflation rate is actually 11.5% and when the Carter administration left office inflation was 14% and 30 year interest rates were at 18%. Plus, prior to the Clinton administration, the 30 year loan was tied to the 15 and 30 year bonds. During the Clinton administration, interest rates were changed to the short term 10 year loans. I believe that the we are about to see interest rates rise like they did during the Carter administration and this is based upon the deficit and the rate of inflation. The only way that I believe that hyper inflation and the deficit won’t enter into this scenario is if a major war is started. According to the fact that the war on terror is once again getting out of control and our military is once again the size it was prior to World War II, and the fact that former Russian dictator Gorbachev said last week as reported on Fox News, that Putin is preparing for a nuclear war. According to defense one.com, the U.S. Department of Defense is in the process of making plans for World War III. Therefore, there is a very good probability that hyper inflation will not happen due to the possibility of war. I would love to see the article rewritten with these issues taken into consideration with the all of these issues brought into consideration.